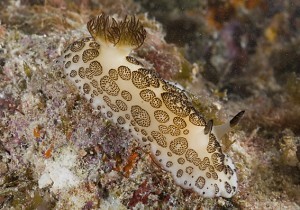 This nudibranch species (30-50mm in length, occasionally much larger) is easily identified by its distinctive white body colour decorated with large black circles composed of numerous raised papillae. Both the gills and anterior rhinophore organs are black. The overall body texture is rough due to supporting spicules in the skin. The Funeral Pyre Nudibranch lives from the intertidal region down to about 12m, mostly associated with coral reefs. This species is a sponge-feeder (known to be associated with the blue sponges of the genera Ianthella, Haliclona, Xestospongia and Euplacella) and lays a white, crinkled, spiral egg-ribbon.